Shopping for Designer Art Toys Statues? That ominous feeling of being watched you long for. 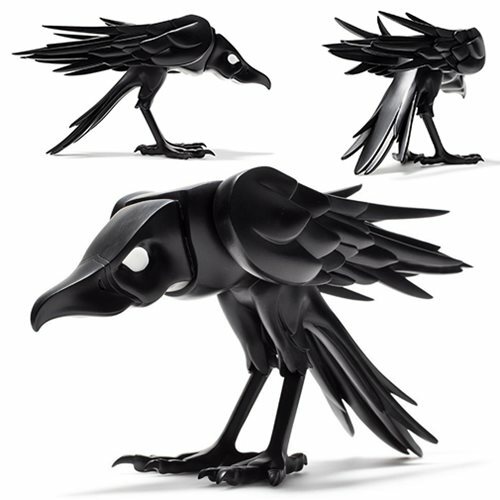 The resin raven figure is limited to only 300 pieces. Such an observant, ever-present, gloomy addition to your home! Have you ever felt that ominous feeling of being watched, only to look over your shoulder and discover a conspiracy of ravens lurking somewhere around you? Why are they there. What is their purpose? It can only be sinister. Colus and Kidrobot have captured that feeling in this resin Colus Ravenous Medium Figure. Limited to only 300 pieces worldwide, the matte black creature adds an observant, ever-present, and gloomy addition to any space in your home. Order one today before it flies... nevermore to be seen! Ages 15 and up.